Sngmoo Lee's fantasy western will ride onto Blu-ray this June. 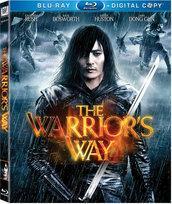 In an early announcement to retailers, 20th Century Fox says 'The Warrior's Way' for Blu-ray on June 28. The action-packed film stars Jang Dong-gun ('Tae Guk Gi: The Brotherhood of War'), Kate Bosworth ('Blue Crush') and Geoffrey Rush ('Pirates of the Caribbean,' 'The King's Speech'). The Blu-ray will feature 1080p video, a DTS-HD Master Audio 5.1 soundtrack, and supplements include deleted scenes, behind the scenes footage, and a digital copy. You can find the latest specs for 'The Warrior's Way' linked from our Blu-ray Release Schedule, where it's indexed under June 28.